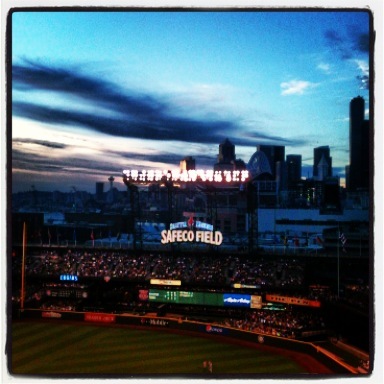 A wee little Instagram picture I took last year, mid-season. One thing I absolutely love about our park is the view of the downtown area. When I chose section 331 for my first season, I picked it specifically because it was behind the plate and up high enough to get a view of downtown, the scoreboard, and the game. I like the closer view I have been experiencing with tickets in left field over the past few years, but there is something about the 300 level that is just wonderful. Every now and then, I’ll go up to the area over right or right center, and sit in those seats by myself and just take everything in. It’s especially nice on hotter days, because the breeze from the Sound kind of rolls around up there. 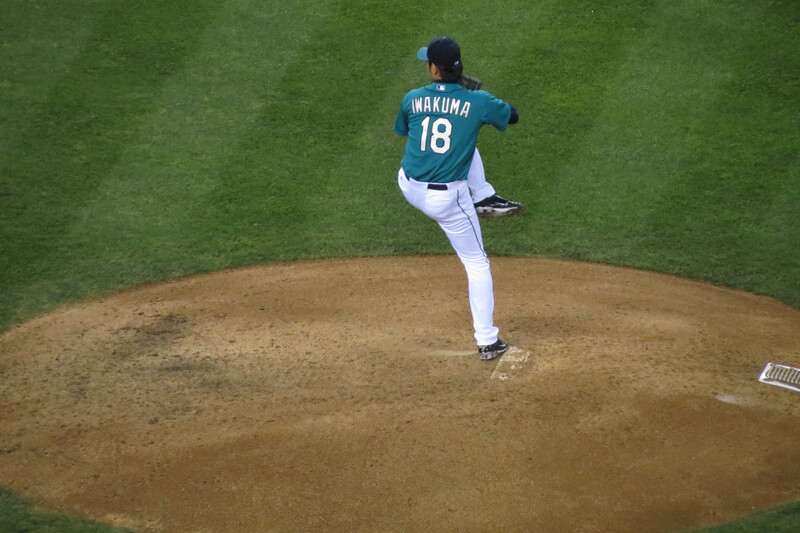 Hisashi Iwakuma, going in for the strike. One of the mysteries of pitchers, for me, is how they can throw so fast while winding up like this. If you’ve tried it (I have), you would notice that it is a completely unnatural motion for a human being to make to merely throw things. I get the concept of putting all your power behind the ball, but the coordination of lifting your lead foot while getting ready to throw in a straight line boggles me. I can either throw in a straight line like a person would normally throw something, or I can do something like this and the ball does whatever it wants. A friend of mine once tried to teach me how to pitch (he played in school), and he would instruct me from the plate on what to do. He is lucky to be alive, though I’m pretty sure a 30MPH pitch (and I’m probably being generous) wouldn’t have really hurt anyone. What I lack in pitching ability I make up for in gripping the ball. That, too, is unnatural, but if you need a grip on a forkball or a knuckler, I’m your gal. I tend to overlook a lot of art in the park, as over the years, it has just become more of the scenery. This year, I want to get good photos of all of these, as they are everywhere. This one, in case you can’t tell, is behind center field. 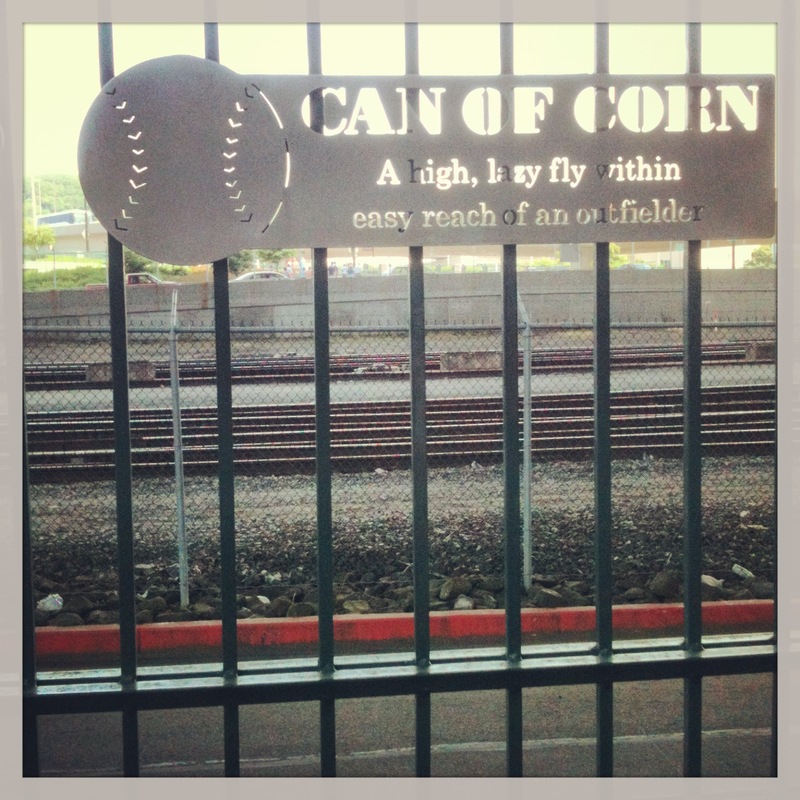 I was waiting for someone back there on a warm day and noticed that the fence separating Safeco from the rest of the world features these little plaques. Similar plaques can also be found on the front of the home plate entrance, along the gates. I am hoping I have the time and wherewithal to notice small pieces of art like this in the parks I will be visiting in a month (seriously, it’s in a month! ), but I have the feeling I might be a little overwhelmed. I have been watching a few Spring Training games here and there on TV when I can. Sunday and Tuesday I managed to catch the Orioles playing the Red Sox and Yankees, respectively. Tomorrow, the Mariners are playing the Dodgers (I think?) at around noon or 1PM, which will be broadcast on ROOTSports NW. Since work has been taking it out of me this week, I have not been able to get to the store to grab batteries for my little sport radio to listen, so I have been keeping a general eye on Ms scores, but nothing in depth just yet. I guess Fernando Rodney allowed a run and two hits the other day, not really something you want to see from your closer, but it’s still early. We had a four-run advantage prior to that, so I’ll cut him some slack, but given the Mariners propensity for creating 1-run games up until the 9th, I’d feel a lot better if Rodney was more stable. Looking forward to actually seeing the Mariners tomorrow; I will be trying to get that Citizens Bank post up over the weekend as well. Enjoy your weekend, everyone!